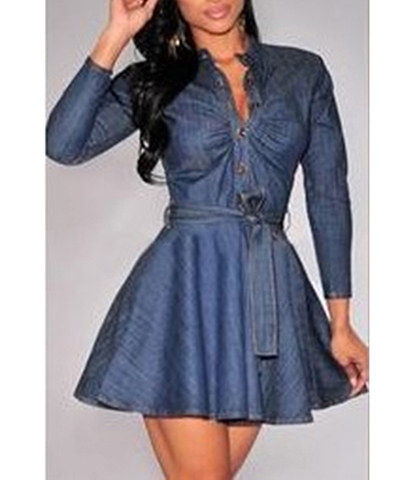 Waist N/A 26" 28" 29.5" 31"
Length N/A 31.5" 32.5" 33" 34"
Our medium blue denim mini dress is a pretty, versatile dress to wear for work or play. It is constructed from a very high quality, cotton denim and is fully machine washable in warm water. We recommend tumble drying on a low temperature setting. The bodice is closely fitted and has gathers around the bust. A small, standup collar surrounds the neckline. The bodice buttons up the front with decorative metal buttons. The sleeves are long and snug, but are not too tight, thanks to the slight stretch added to the fabric. This dress has a pretty full skirt and a self tie belt. It is available for purchase in sizes Small, Medium, Large and Extra Large.